1. 40 episodes X 42 minutes. Song ; Chi Chung Wui Hang Wun (始終會行運) performed by Leslie Cheung. 2. Serie based on the last novel written by Jin Yong, Luk ding gei. 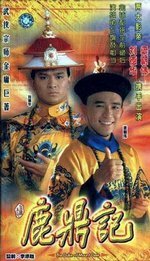 Info : Chi Chung Wui Hang Wun (始終會行運) A Lau & T Leung.